BIRN’s ‘Justice in Kosovo’ (‘Drejtësia në Kosovë’) TV programme and Life in Kosovo (Jeta në Kosovë) newspaper won awards for anti-corruption investigations on the international day against corruption. The awards for anti-corruption reporting were presented to BIRN’s journalists on Wednesday by the United Nations Development Programme (UNDP), the Anti-Corruption Agency (ACA) and the Association of Journalists of Kosovo (AJK). 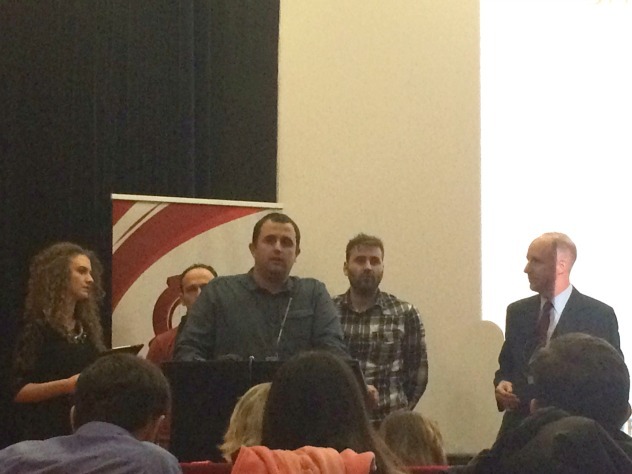 The ‘Justice in Kosovo’ programme team, Kreshnik Gashi, Naim Krasniqi and Behar Mustafa, were awarded for their investigation ‘F2 File’ which began in December 2014. The investigation showed how the contract of the Ministry of Health become the target of allegations of corruption and forgery over the supply of equipment and medicinal products worth millions of euros. After the programme was broadcast, the owners of three companies involved in the case were arrested and the Prosecutor’s Office in Pristina opened a criminal investigation. As a result, the Agency for Medicinal Products and Equipment has cancelled licenses for the Friends company, while the Ministry of Health has suspended its contract with the firm. The Health Inspectorate has also blocked stocks of the company’s medicines. “It is a motivation for us to go further,” said Kreshnik Gashi, the editor of ‘Justice in Kosovo’. “It is a concern the fact that corruption is increasing in this country, and the number of investigations into corruption are decreasing, as is shown by the number of applications, because every day the number of journalists who fight corruption is decreasing, and this should be a warning for all of us,” Gashi added. The newspaper ‘Life in Kosovo’, was awarded for a story entitled “Suspicious Emeritus of UP”, about corruption in the education system. This story shows how the three professors at the University of Pristina, who hold the title “Professor Emeritus” do not meet even the basic requirements to keep that title. Zejnel Kelmendi, Faik Brestovci and Mujë Rugova are those who hold this title – two of them were former rectors of UP. They receive the same salary as the regular professors in UP – over 1,429 euros. But several years later, UP had come to the conclusion that they do not meet the basic criteria to get that title. In fact, it is said that neither their files for these titles are listed in the Rectorat.